Freakish "crumb" topping. Don't know what went wrong and too tired to try to figure it out. This morning, I jumped out of bed at 5 am thinking it was Friday…and was so disappointed. 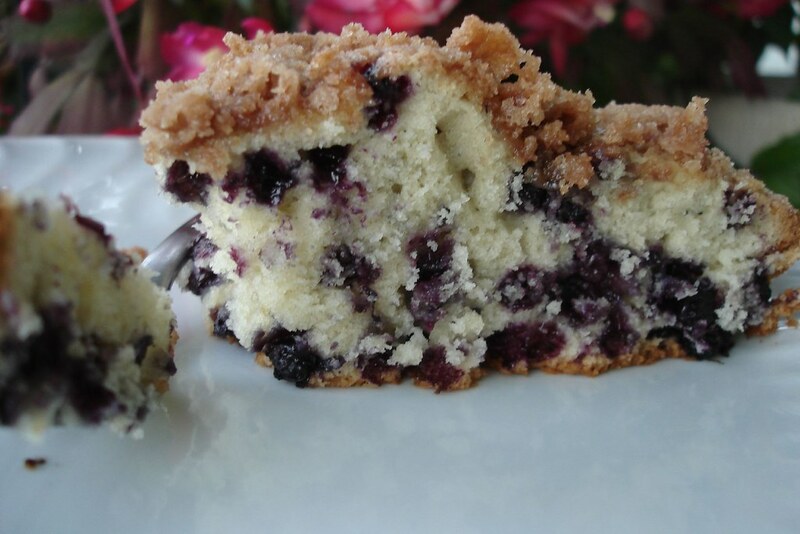 I made the Blueberry Crumb Cake from “Fearless Baking” by Elinor Klivans (page 153). According to her cookbook, she got the recipe from the Pineapple Inn in Nantucket. Sure, in my last post, I did a whole bit about fresh fall fruits and veggies…and I now use a crop that is out-of-season. What’s the secret? Freezeriness! I had three opened bags of Wild Maine Blueberries from Trader Joe's in the freezer that I purchased and purchased and purchased (and opened and opened and opened) recently during my short lived smoothie faze. The entire recipe calls for only one stick of butter. 5 tablespoons for the batter and 3 tablespoons for the topping. Pleeeeeease. I should have known better. The resulting cake was more like a semi-low-fat muffin with crazy crumb topping. It wasn’t bad…it just wasn’t cake. 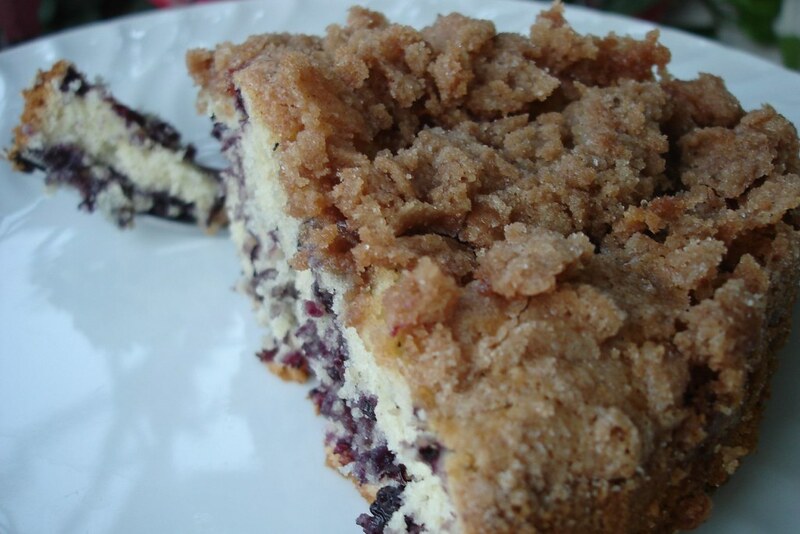 The crumb topping is absolutely necessary because it gives the cake those essential mouth-feel moments. I don’t know why my crumb topping looks a little strange, but I have issues with streusel toppings! 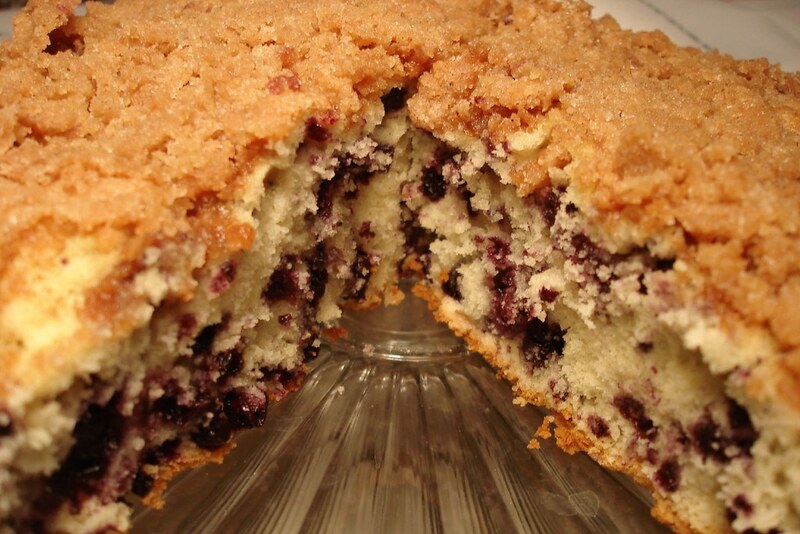 Overall, I might make this cake again for breakfast and serve it hot from the oven…and/or use cream instead of milk in the batter. I guess my baking experience has taught me one thing: how to tell when something doesn’t have enough fat! By the way, did you catch Project Runway last night? I’m not spoiling anything…but I’m not too keen on any one designer...and we already found our Stephen/Marcel (to use Top Chef terminology). That first episode is much like crazy speed dating - trying to find out who you like in just a few moments! It looks good to me too. I'm starving! Don't fret though, you're not the only one who has issues with struesel topping. I never can make it clump properly no matter whose recipe I use. Now I jump spread it out and hope for the best, lol.